I bet you read the title to this post, and thought I was one of those no-technology, stick-to-the-outdoors sort of moms that somehow get their toddlers to eat vegetables at every meal, and don’t even have televisions at their houses. I’m definitely not one of those. My family has regular movie nights, where we watch entire movies, even beyond our “expert”-allotted one hour of screen time and right before a later bedtime. My kids eat veggies when they’re in pasta sauce or baked into muffins. And get this: we don’t even go outside some days, especially if it’s all that hot. But sometimes, we have opportunities to live life unplugged. My daughter has a keen imagination and could play dress up for hours. My older son loves wooden trains and tracks, and spends entire mornings rolling them along the tracks or on table edges, seeing if they’re going to crash when the magnets carry too much. They love coloring, blanket fort building, helping in the garden, and recently, the Olympics have brought on a random but fun interest in volleyball. My oldest and I are reading our first chapter book together, and imagining the pictures as we go along. I’m not pretending that we do these things every day. Sometimes, we don’t have a totally unplugged day for weeks at a time. 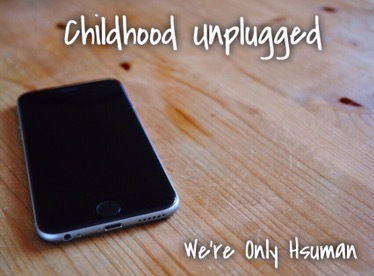 But when we do… when I forget I have an iPhone, I don’t care what’s on TV, I lose track of time, and we just play… Those are the times I feel like I’m sharing my own childhood with them. I remember days of reading book after book, throwing sheets over the dining room chairs and hiding underneath, filling giant coloring books with crayon colors, and swinging for hours. I love sharing my favorite movies with them, or playing reading games on the iPad, but sometimes, somehow, unplugged is just sweeter. Now, I’ll be crying by the end of tomorrow about how my preschoolers won’t stop fighting, and I’ll have broken the unplugged magic by lunchtime, but hey- it can’t be every day.